Linda your card is just so fun and fabulous. I love how your have the little houses in the corner for accent. Great job with the sketch. Thank you so much for playing along with the Midnight Madness Sketch Challenge. Linda - your coloring is super!! I love her hair shades too. beautiful, i love the little scene you created with the little houses and all.. great job ;) thank you for joining us on the Pattie's creations challenge ;) Good Luck! Linda, I just love the way you colored Pattieboop & Allie. 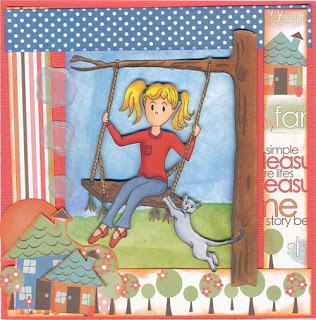 This is such a cute card and I love the papers that you used. Linda, this is great! The entire scene is beautiful. Your coloring is excellent!!! Great job! Thanks for joining us! Linda! I so love your pretty card! The image is just so fun, and the houses in the corner is just perfect! Thanks so much for playing this week in the Midnight Madness Sketch Challenge! Hugs! What a fun card! Love your image & design. Thanks so much for joining us this week at Midnight Madness!